Ownership / Access: Ardglass Golf Club. Notes: Audley's Castle is a 15th-century castle located 1 mile (1.6 km) north-east of Strangford, County Down, Northern Ireland, on a rocky height overlooking Strangford Lough. It is a three-storey Tower house named after its 16th century owner, John Audley. Audley's Castle tower house and bawn is a State Care Historic Monument in the townland of Castleward, in Down District Council area, at grid ref: J5781 5058. 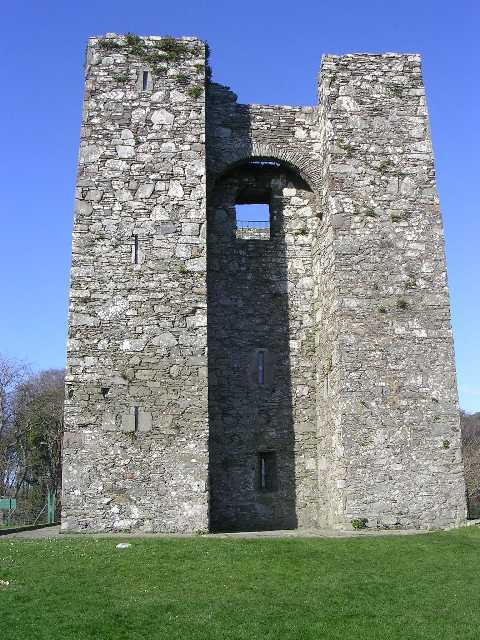 There are thousands of small stone towers similar to Audley's Castle in the Irish countryside. They are one of the commonest of archaeological sites, which indicates these were not buildings put up for the higher aristocracy, but for lesser lords and gentry. Most were built in the late Middle Ages (roughly 1350-1550). Audley's was built towards the end of this period. The castle is probably of 15th century date, but its early history is unknown. The castle is named after its late 16th century owners, the Audleys, a Hiberno-Norman family who held land in the area in the 13th century, although it is not known if they built the castle. It was sold, with the surrounding estate, to the Ward family in 1646 and used in 1738 as an eye-catching focus of the long vista along Castle Ward's artificial lake, Temple Water.